I know we have talked about this before [click here], but bring us up to speed: Your movie Hell Town - in a few words, what is it about? 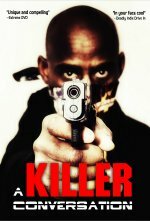 It�s a killer serial. It�s a soap opera slasher TV series that is presented as a feature film. 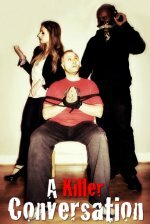 With Hell Town being a fake TV soap opera - what do you find so interesting about that genre as such, and any soaps your movie is specifically based on? Not specifically, although, while growing up, Elizabeth (the co-director and co-writer) was obsessed with Passions and I was obsessed with Dynasty and anything involving cliffhangers and melodramatic murders. How much fun was it to dream up all of the movie's soapy over-the-top storylines, actually? Oh my god, it was hysterically fun. In a soap opera there are no rules to planet Earth. Literally anything goes, and makes sense. 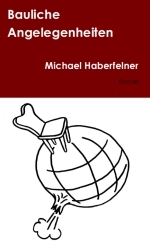 There�s a freedom in writing that kind of thing that is liberating. After all that talk about soaps, you just have to talk about Hell Town's horror content for a bit as well! Yes, it was equally as fun to imagine wild ways to kill people. We really had a blast thinking of the most insane ways somebody could die, and then weaving those kills into the storyline. I mean, donuts� Right!? What can you tell us about your co-writers, and what did each of them bring to the table? As one would imagine a real soap opera being written and directed by different people, we wanted to have that feeling in the movie. So we jobbed out certain scenes to different people and let them have a field day � doing whatever they wanted to do. Then, Elizabeth and I would edit or rewrite it. You have to talk about your co-director Elizabeth Spear for a bit, and what was your collaboration like, along which lines did you split responsibilities, and the like? Elizabeth and I were on such the same page while writing and making this movie that it was a blast. We split up duties on the set so instead of the typical 10 things a director might be in charge of, she took five and I took five. We wanted the actors to play it real, and really commit to the insanity. On one hand, our actors were playing actors who were playing characters on a TV show. So it�s a bit one-step removed from a regular performance. And they nailed it. It�s actually very challenging to be aware of acting over-the-top and saying ridiculous lines of dialogue while still remaining true to the overall tone. 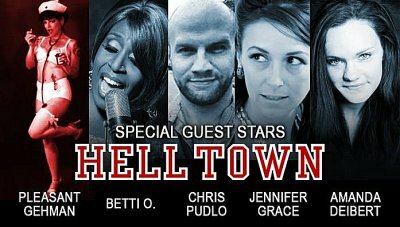 After the first "episode" of Hell Town, actress BeckiJo Neill is replaced by Jennifer Grace - was this a move necessitated by availability, or was this planned all along to be more in tune with the soaps the movie imitates? Yes, it was planned all along and part of the joke. What can you tell us about Hell Town's cast, and what was it like working with them? When I�m scheduling a movie, I try and make it really light. So each day is a joy. Less than 10 hours a day, with good solid meals. Actually, I schedule things based solely around meals and mealtime. It�s important that everyone stays well fed and rested. It makes no sense to try and work 12-14 hours a day. That�s just illogical. Some people say they do that to save money. But if they planned better and were more organized, they wouldn�t need to spend any more money and they�d be able to accomplish more in less time. It�s amazing. Watching Hell Town in a group is wild. People get really into it, very vocal. And critically, everyone seems smart enough to get the joke and have fun with it. At Crimson Screen Film Festival recently Hell Town won Best Feature Film and Amanda Diebert won Best Actress! I know the preview at the end of Hell Town only serves parodistic purposes, but have you ever mused about how the story might go on, and could you ever be persuaded to do a sequel? I would LOVE to do a sequel � and dream of directing an ongoing Hell Town series. How much fun that would be! Many fans are already begging for an actual series, so maybe a Netflix, Logo, Hulu type will get the hint and do it! Right after making Hell Town, I filmed a mysterious drama set in Mexico called El Ganzo. A very different movie on the other end of the tone scale. It�s also getting ready to go on the festival circuit. El Ganzo is in the main competition for Italy�s Salento International Film Festival this September. I�m curious if you think you�re still able to eat a donut after having watched Hell Town!